Do you find yourself thinking that quitting the binge eating habit may work for others, but not for you? Do you think your life is more complicated than others who have recovered? Do you think your binge eating may have developed for deeper reasons, or that you have too many struggles in your life to recover? 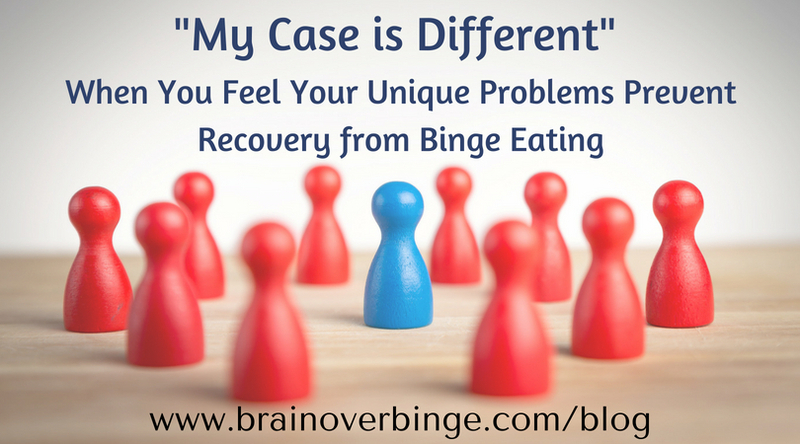 Do you have an underlying belief that your case is different, and that you can’t just stop the binge eating habit? If you are feeling this way, know that you are not alone, and many who feel stuck in recovery share your same feelings. You are not alone in thinking that your case is different…and of course it is. No one’s life, or circumstances, or problems, or even behaviors with food are exactly the same, but you can learn to move forward in recovery despite whatever may be different about you. But, don’t get stuck in trying to get “ready” for recovery for very long. The truth is that everyone, at every moment in time, can find at least one unique problem in their life that they think may prevent recovery, but every day there are people who end this destructive habit. We are all guilty of thinking we are somehow different and have a tougher road, even in other parts of our lives. One example where I am guilty of this in my own life is in trying to be a more patient mother. I sometimes read inspirational blog posts/books about motherhood, which address how to be more understanding with your kids, enjoy them more, put their misbehavior in perspective, and stay calm. While these writings are great and helpful to read, I often have a voice in my head telling me that most of these posts or books are or must be written by women who have less children, or older children, or a nanny, or more support in their lives from their spouse or family, or who aren’t working as well, or who have a naturally less-anxious personality. Then I’ll have thoughts telling me that my case is different, and I’m simply doomed to be anxious and stressed every day. This “my case is different” voice is not truth. There are many moms in my exact situation, and moms who have more kids and taking on much more than me, without any support, who handle it with a much greater sense of calm than I do. And, even if an inspirational mothering blog post is written by a mom of one or two older children who are in school most of the day, it doesn’t make it any less meaningful because that mom, or any parent, certainly has some reasons that she feels uniquely taxed beyond her means, or challenges in her life that she could easily let hold her back. That mom could without a doubt find many justifications in her own life for becoming impatient or unhappy in her role as a mother. The point as it relates to binge eating recovery is: even if a recovered person’s life looks better than yours on the surface, you have no idea what that person is going through or has gone through in her/his life. I realize that in Brain over Binge, it may have seemed like my life was going relatively well at the time I quit binge eating. I didn’t have major trauma going on, I was married, and I was enjoying my job for the most part. But, there were still many problems and challenges under the surface, and my life was far from being easy. The truth is, we all can find an excuse. We all can find a reason that we can’t do what someone else has done. We can all find a reason to remain stagnant, to keep analyzing without acting, to keep saying “my case is different,” and to attribute other people’s success to their circumstances or their easy lives. There are things that make you different, that is true; and that is why not everyone will recover on the same timeline and in exactly the same way; but whatever you are facing, you can make recovery work despite that. There are definitely reasons that some people stop binge eating right away and others take longer, just like there are reasons that some people have an easier time being patient with their kids! Just because your case is different doesn’t mean recovery is out of your reach, or that you should ever give up. If you feel like you can’t stop acting on binge urges right now, and you think there are some issues holding you back, then get to work on those issues if you feel it will help; but know that the “my case is different” thoughts will likely still be there afterward–and at any time you attempt to quit. I think the best course of action is to treat the “my case is different” thoughts as neurological junk. They are automatic, habitual thoughts that you’ve believed in the past, so now they keep coming up and perpetuating your habit. You can choose to dismiss these thoughts, and any other thought that encourages you to stay stuck. You can realize that everyone’s case IS different, but everyone, including you, can find a way to recovery. If you are new here, you can get started with the Brain over Binge approach by subscribing to my newsletter and updates, and as my gift to you, you’ll also receive my free eBook, “The Brain over Binge Basics” (This eBook is a 22-page guide that will teach you how you can stop acting on binge urges). ← How Much Should I Eat?